It took an entrepreneur with an engineering degree to bring healthy humanely-processed Halal chicken to America’s dinner tables. In 1996, Ahmad Adam sold his first fresh, nutritious chicken. Today, Crescent Foods is the largest provider of premium Halal poultry across the United States. We provide Poultry in a variety of forms and packaging to retail stores, restaurants and institutions. It is not just our logo that you see evolve over the years, we strive very hard to make good better and to make better the best. Our corporate growth has been constant but controlled, maintained at a pace that assures our ability to provide first rate service to our customers. At Crescent Foods, we are not in the poultry business just for the dollars and cents. We are dedicated to our mission to provide healthy meals to families across the board. We might be pioneers in the industry, but our story has just begun. We have great plans and several exciting new products up our sleeves. Enjoy our newly launched Angus Grass-Fed, Grass-Finished beef products. 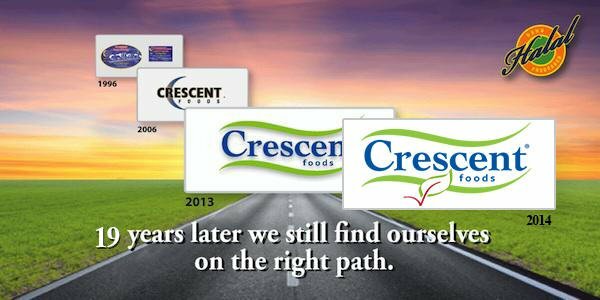 We are grateful for your trust and confidence in Crescent Foods.